Part 10? How can that be? In February 2012 I posted my final Livewire puzzles post which was number 9 in the series. In the intervening time more than half of those that I considered best in their line up have been discontinued (so now I'm afraid it is up to you to find them on Ebay) but luckily they have also released an extra 5 puzzles. At the end of last year, I contacted them and managed to buy the 4 that had been released and they told me of their very latest one about to be released for 2014, the Roller Coaster puzzle and offered me the opportunity to buy it early. They arrived in November and after photographing them and realising that all but one was in the "difficult" range, I sort of fiddled and shied away! My excuse was that I had been preoccupied with work and other puzzles. But, after a few weeks when Mrs S was off visiting her parents and I was alone in the house for a few days, I could play with them and jingle to my heart's content without having to worry about receiving any damage from the laser burning stare and the whiplash 'cat-o-nine tails' tongue! Yes she has been honing her violence skills! I began with the easiest of the 5 new additions - The Ringleader. This one is the only one of the 5 that is on the level 2 page of Livewire puzzles (rated 7/10) and I was reassured by that. "At first glance Ringleader appears similar to puzzles we've made in the past. It is, however, markedly unique. 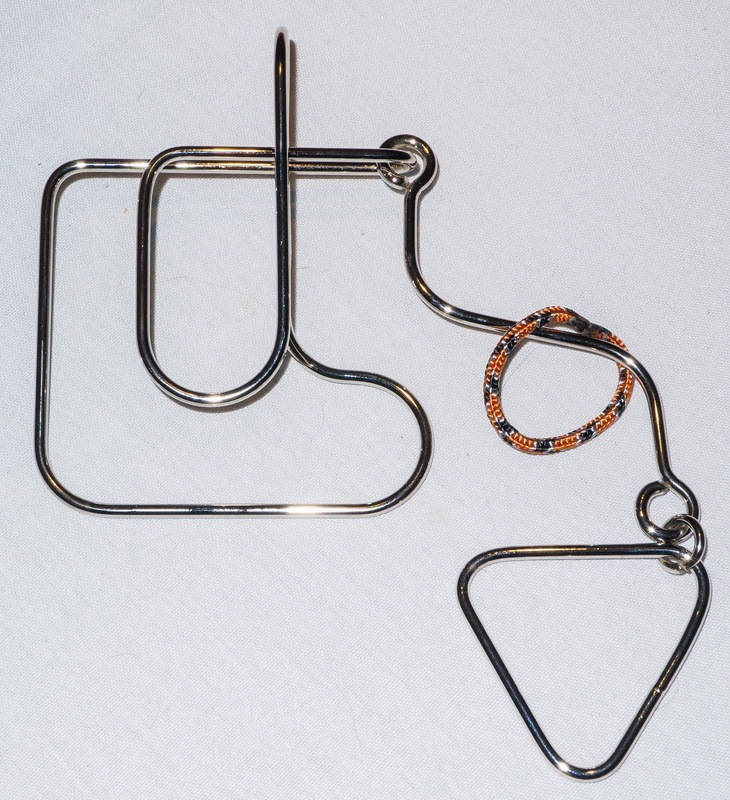 The coil combined with the rigid nature of all the components of the puzzle require the solver to incorporate several subtle moves in order to remove the ring. 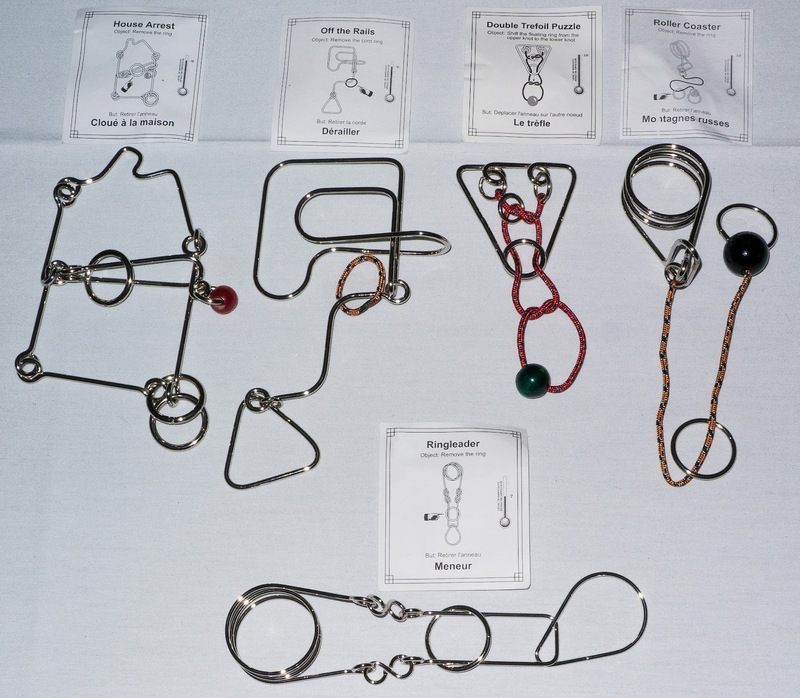 Despite its relatively simple appearance, Ringleader is definitely trickier than it looks." This is absolutely true! To me I immediately thought of the classic horseshoe puzzle but having one of the horseshoes modified must be important! In fact everyone I have handed it to has had the same idea. But in reality that similarity is minimal - it is possible to use the "horseshoe manoeuvre" but it is not actually necessary at all! The teardrop is a real problem - it blocks a lot of what you want to do. This is quite a big puzzle at 24cm long and nicely made of anodised steel. Theoretically you want to just pull the ring off the right hand side and so the initial aim is to move the teardrop to somewhere out of the way. Good luck with that one. I persisted with that for about 20 minutes before giving up on it. 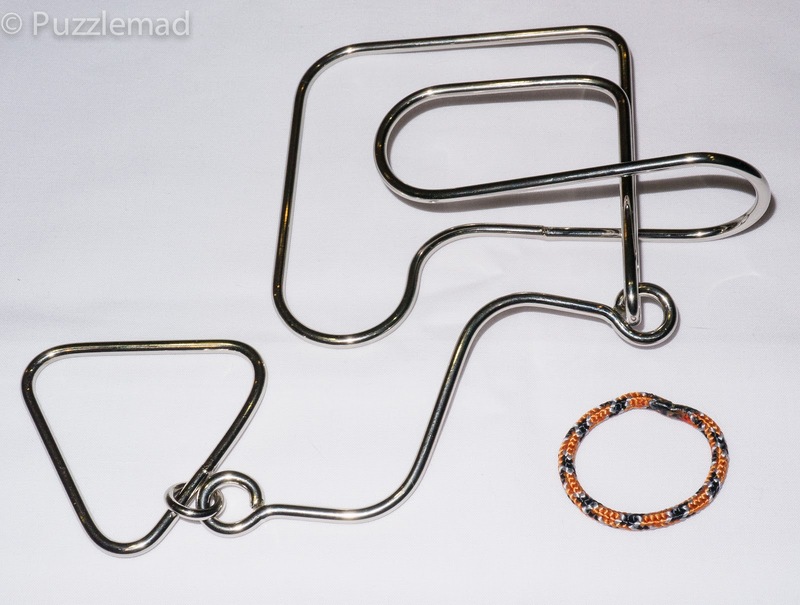 Next is to actually feed the ring onto one arm of the puzzle like the horseshoe and get it to the other side which is not blocked by the teardrop. I spent another 20 minutes doing that too and really ended up getting tangled up. I was stumped and only by a puzzle that they have labeled at difficulty level 7! Was I that rusty at these? Apparently. After a short break I had a brainwave and went back to it. They are emphatic that there is no need to distort the coil at all and I concentrated on how I could manoeuvre the ring around the coil without getting tangled and suddenly it was free! Fantastic - now could I undo what I had done? It took me several goes to reassemble the puzzle - the movements required are really quite subtle and need to be done just so for it to be possible with no distortion. It is a lovely and well hidden set of moves that are needed and, due to the sheer complexity of the shape it can be quite hard to see. I have given this to quite a few people over the last month or so and have been surprised. The experienced puzzler struggled with it for ages but a complete newbie managed it in less than 1/2 hour! I even gave to a friend who has a really good 3D ability who had undone and reassembled Derek's helical burr which is a tremendous feat - after an hour he had to give up on it and ask me to show him. This is definitely a great puzzle - not too hard but has enough in it to bamboozle people. You also don't need to worry about knots! Second in my series (and all the remainder) come from Livewire's level 3 page i.e. difficult. This one, The Off the rails puzzle was rated as 9/10 and is therefore expected to cause me some trouble. This one looks rather similar to some of the puzzles I have previously solved from Puzzle Master - the destroyer - so I figured that it would not prove too much of a challenge. It also has only a short loop of string and so would not get too knotted during my exploration. 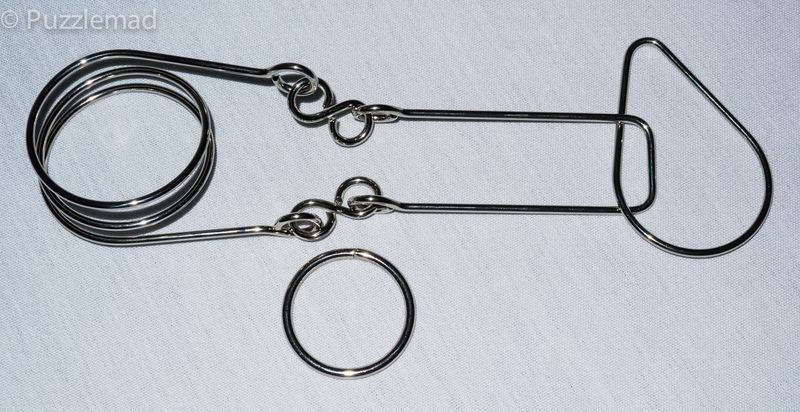 It also has a similarity to the classic Ball and ring puzzle but the ring is flexible and the dangling part is rigid! It was based on Kirill Grebnev's Step puzzle. It is quite large at 24 x 11 cm and like everything from the company, very well made. So, despite there being so many similarities to other puzzles I actually could not find any common moves at all. This one really confused me for a very long time - there are lots of blind ends and some very interesting ways you can manipulate that little ring of string. I ended up trying to solve it for days before I finally with some relief triumphantly removed that string! I immediately put it back and for the life of me I could not take it off again. It took me another 2 days before I managed it and to my huge surprise it came off in a different place!! Looking at this one I can see that there are 2 topologically equivalent places - I have finally mastered the solution but have yet to repeat my very first solve method despite 2 months of trying! 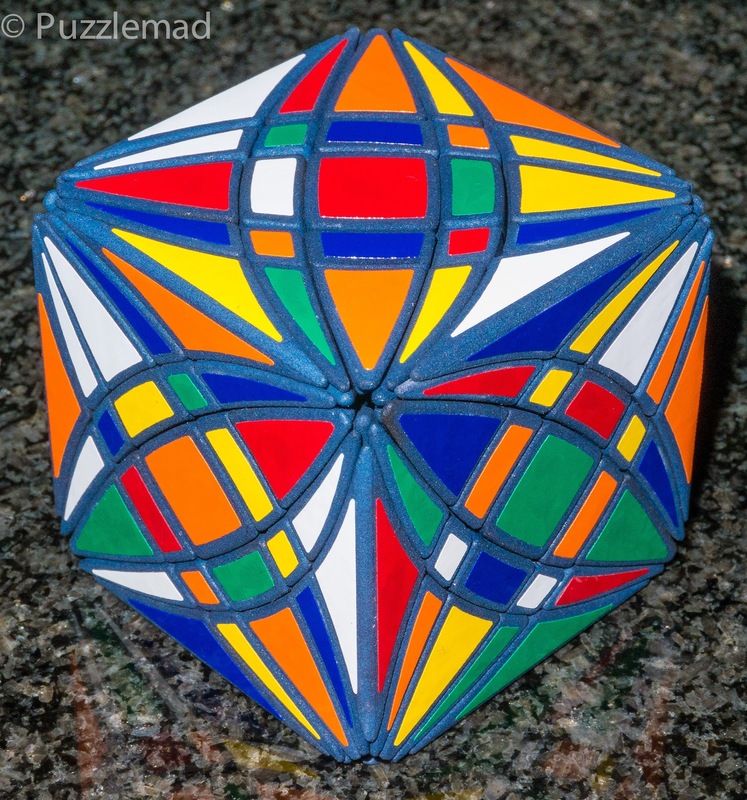 This puzzle is fabulous - it is really tough and probably not for beginners but for a true puzzler there is a beautiful elegance to it and you will not regret buying it! Early on when I was branching out from the basic Rubik cubes I discovered that there were twisty puzzles out there which had a similar idea but a completely different turning mechanism. I extolled the virtues of the edge turning Curvy Copter and the Corner Turning Rex Cube - they are both fabulous puzzles that should be in EVERY collection and in fact they are quite a bit simpler than the standard Rubik cube. 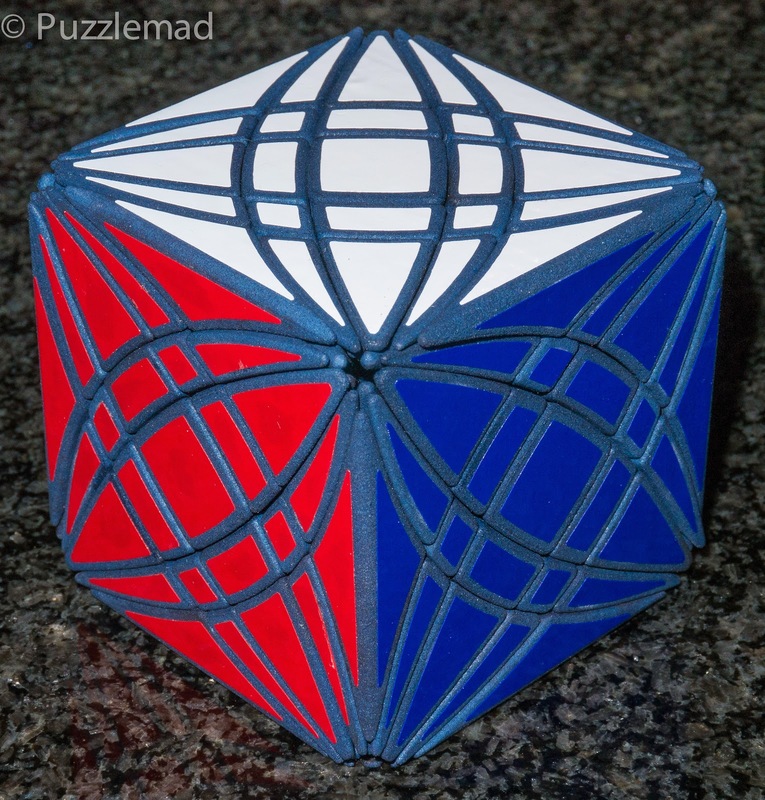 I then managed to torture myself for months with a higher order (master) version of the Curvy Copter designed and finally solved it after a hell of a struggle. Recently a very young designer, Ben Streeter has managed to design a Master version of the Rex cube and I could not resist ordering one. If you would like one then it is available from Ben's shapeways shop. I very rapidly admired it and then scrambled it - i have no idea whether I will manage it but I will give it a good try!